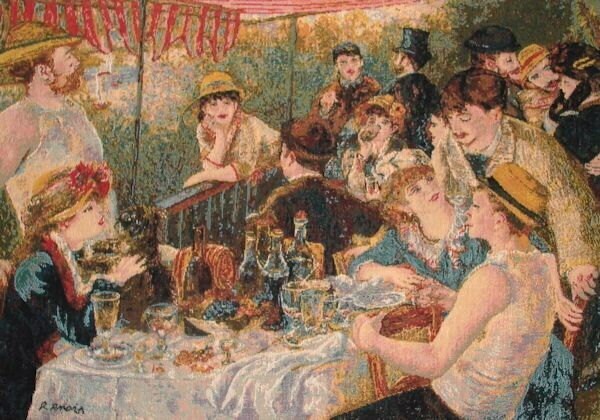 This Museum Collection wall tapestry shows "Le Déjeuner des Canotiers by Pierre-Auguste Renoir. It was painted in 1881 (220 Kb); "The Luncheon of the Boating Party"; Oil on canvas, 129.5 x 172.7 cm (51 x 68 in) Phillips Memorial Gallery, Washington, DC. Pride of the Phillips Collection, it was bought from the artist in 1881, and remained in Durand-Ruel's private collection until 1923, when his sons sold it to Duncan Phillips. According to Renoir himself it was towards 1883 that there came a break in his work and he felt that he had reached the end of Impressionism, but a change of style is already discernible in this large painting of 1881. His earlier picture of canotiers at lunch arrived at a balance between Impressionist technique and subject interest; here style is subordinate to genre, or is altered to suit its purposes. There is definite outline where formerly there was the surrounding ambience of light. The memory of the aristocratic fête champêtre that gave a lingering flagrance to earlier open-air groups has not entirely vanished but a sharper impression of slightly vulgar jollity tends to dispel it. In the wealth of detail and incident something of the unity that is so admirable a feature of Impressionism in general is lost. But there is also much to admire: the fascinating glimpse of the river; the still-life with its richness of fruit and wine; the varied poses and expressions of the party. Such as large work was of necessity painted in the studio but Renoir was already coming to the conclusion, contrary to his earlier practice, that painting direct from nature had many drawbacks compared to studio work --- that it made compositions impossible and soon fell into monotony. The work of Monet and Pissarro might disprove this assertion as a generality but it served to give Renoir a fresh individual impetus.